In 1945, a young accounting student from Auckland, New Zealand, committed himself to become a missionary. Seven years later, he waded ashore on the northern coast of New Guinea - his baggage unceremoniously dumped on the beach and supplies of fuel tossed overboard to float in on the tide. This was the start of an incredible journey for Kay Liddle - a journey into a formidable stone-age world and the start of a lifelong relationship with this remarkable country. Into the Heart of Papua New Guinea is Kay's personal story of years spent in service and partnership. It is filled with the difficulties, challenges and rewards of a dramatic life of mission - making first contact with people who regarded 'white skins' as ancestral spirits, narrowly avoiding death by ambush, sleeping with the dead in a community tree house, learning new languages, facing cargo cults, trekking with his wife and family over steep mountain trails and travelling in dugout canoes on crocodile infested waterways. It is also the story of Christianity taking root and transforming the lives of ordinary Papuans - sharing the Good News, seeing whole groups of people move towards God, establishing churches, and training leaders. This book provides an account of the valuable mission partnerships that were forged between the Christian Brethren Mission and MAF, CLTC, Bible Society, SIL, World Vision and the Evangelical Alliance. It is also something of a de-brief on Christian work in Papua New Guinea in the years leading up to independent nationhood. As such, it is not only an absorbing story but also, together with Book Two, a valuable resource for those involved in the practice and policy of mission service today. Join Kay and Gwen on their journey into the heart of Papua New Guinea. 456 pages with full colour images. "In this candid autobiography Kay invites us into his and Gwen's day to day events, concerns and developing perspectives ... as pioneer missionaries... 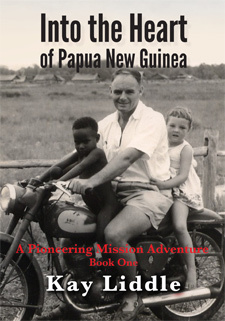 He intertwines his personal and family story with a wealth of mission history, strategy, and policy-in-the-making, plus his deep insights into the customs and culture of his neighbours... 'Papa Kay' ... thank you sincerely for making it available for us all to continue to draw on and benefit from." Kay Liddle served God and the people of PNG as a leader of a mission team, member of two District Advisory Councils and a Local Level Government Council, and as a foundation member of the Bible Society's Pidgin Translation Committee. After his return to New Zealand, he continued this service through board and council membership of WVNZ, MAF and CLTC and returned to PNG many times to conduct leadership seminars. The PNG government recognised these services with the recent award of an MBE.